It’s time for another read-a-thon! This is my fifth time participating in Bout of Books. It may be my favourite read-a-thon. Why? It’s so chill. The goal is simply to read. As much as you can. There’s no strict number of pages or books or hours to aim for. It’s not stressful. Just encouraging. You can see my past Bout of Books participation here. I’m about 8 books behind on my reading goal of 100 books this year. I’m hoping that this round of Bout of Books will help me catch up. So, I’m aiming to read a whole boatload of graphic novels. Last but not least, I’ll also have an audio book to listen to when I drive – gotta get as much reading in as possible – I’m just not sure yet what that book will be. Stay tuned! Follow my reading progress and my participation in fun challenges on Twitter, Facebook and Instagram each day or here on the blog through out the week. 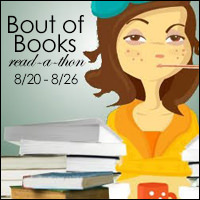 Have you signed up for Bout of Books yet? You don’t have to write a blog post to sign up. You can tweet or post on instagram too. Just add your link to the sign up and you’ll be in the running to win the grand prize.